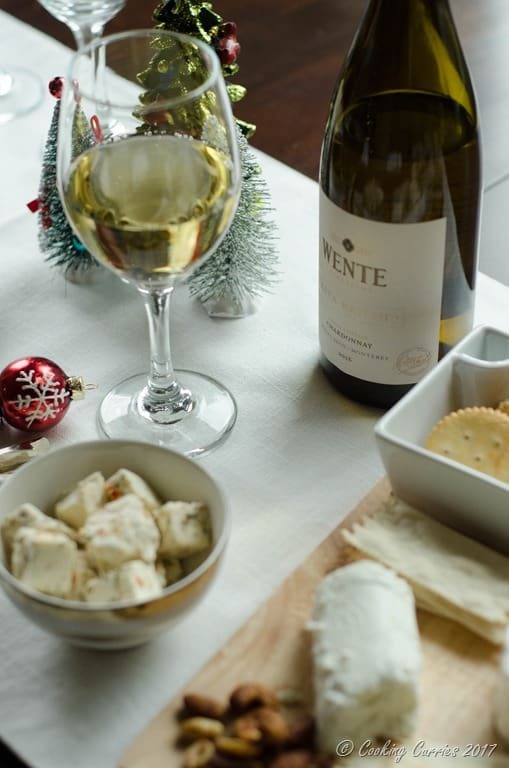 Tips on hosting a successful and stress free wine and cheese party as part of your holiday entertaining! Holidays can be a whole lot of fun as well as stressful at the same time. Especially if you entertain a lot. The whole planning, prepping and the actual execution can wear you out before you can enjoy the party. 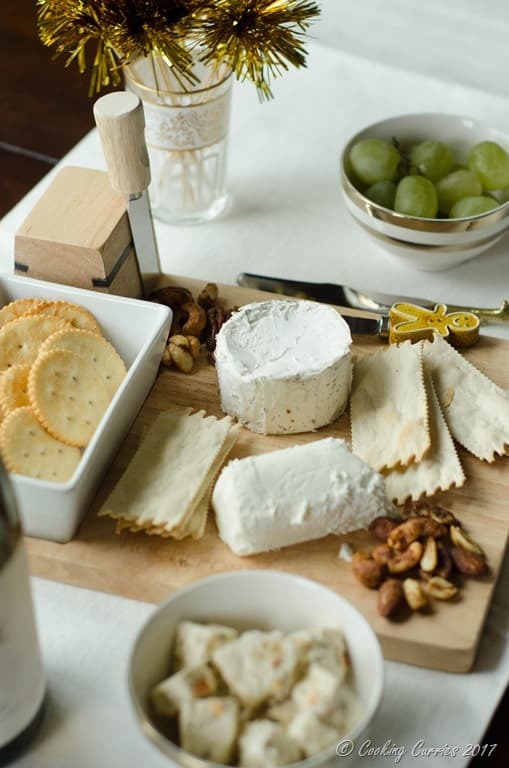 My go-to for stress free entertaining is to throw a wine and cheese party – where there is lots of good wine to drink and many small plate type appetizers along with a cheese plate. There will be enough food to keep everyone full and happy with not a whole lot of cooking and spending time in the kitchen to pull it off. Lets see how we can do that! This is quite easy to put together actually. Have a few different types of cheese – hard cheese, soft and spreadable cheese and some funky blue cheese / gorgonzola to cater to all tastes and the different kinds of wines you will serve. I also like to throw in a few surprises like flavored cheese or marinated cheese, that your guests may not necessarily expect. Once you put the cheese out on the plate, its time to add some crackers. Spread out a range from regular table crackers to speciality crackers with herbs and dried fruits in them. I like to add a few breadsticks and parmesan crisps, which can double up as crackers as well. Also, arrange a variety of charcuterie and dried meat to the mix. Make sure you keep in mind of any vegetarians you might have in your guest list and you may want to plate the meat on a different platter than the cheese board. You don’t have to spend a lot of time doing this, just have a few holiday décor stuff on the serving table and take out your holiday themed serve ware and flat ware to add to the mood. Also, anything sparkly and shiny will do. This may sound trivial, but trust me, some good music will put everyone in a good mood and will help them enjoy the party more. Create a playlist on spotify or any other music app that you have – it doesn’t have to be necessarily all holiday songs. Mix it up with some fast jazz, bossa nova and Latin tunes to have some change of pace. Make sure that you play the music not too loud and not too soft. You want the music to be in the background but not such that it interferes with conversations. We are not in a club, people! Again, don’t stress too much about this. It’s a wine and cheese party, not dinner party, so this is not the main focus. But think of it as you being a nice hostess and making sure everyone has a little extra to eat in case they enjoy a few extra glasses of wine and get a little hungry. You don’t have to make all the appetizers. There are several frozen ready – to – heat appetizers available in most grocery stores. You can also put out some crusty bread with some olive oil to dip in as well as a large bowl of popcorn. Everyone loves popcorn. You could add a drizzle of truffle oil to make that popcorn a little exotic, if you want. For other wines in the Wente family of wines, look here to go through the list to see what else catches your eye for your party. 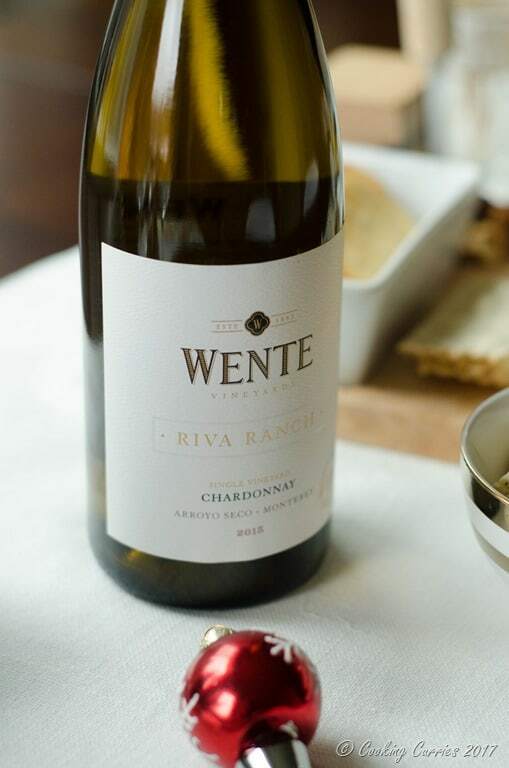 Wente wines can be found in major grocery stores like Safeway and Fred Meyer, here is the store locator, if you want to know where you can find them in your city. 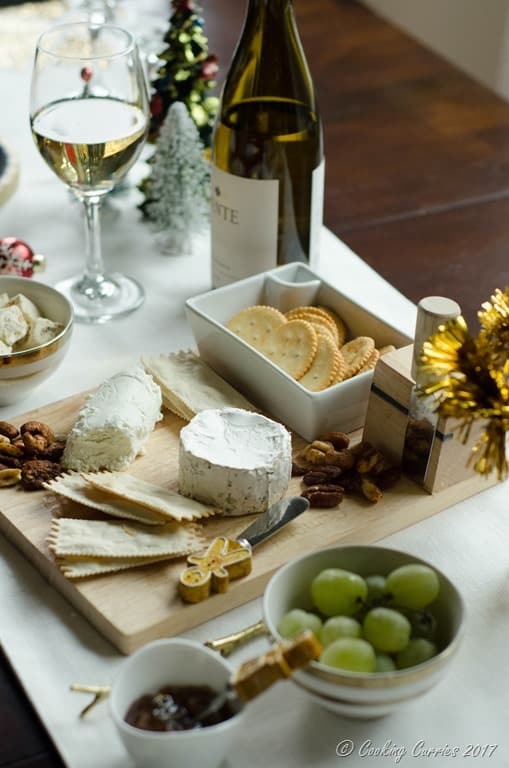 It’s a wine and cheese party, but also keep a few other drinks to serve like juice or some lemonade and definitely lots of water, for guests who may not be drinking or want to take a break from their wine. I know you are throwing the party, that doesn’t mean you don’t get to enjoy it. Don’t forget to pour yourselves a glass of wine, mingle and do enjoy the party. Perfect guideline for holiday entertaining! I love your table decorating styles. It looks very nice. Thank you Jina. Happy Holidays!